SeaWorld is a United States chain of marine mammal parks, oceanariums, and animal theme parks owned by SeaWorld Parks & Entertainment. The parks feature captive orca, sea lion, and dolphin shows and zoological displays featuring various other marine animals. There are operations in Orlando, Florida, San Diego, California, San Antonio and Texas. On March 5, 2007, SeaWorld Orlando announced addition of the Aquatica water park to its adventure park family, which already includes SeaWorld and Discovery Cove. SeaWorld parks also feature a variety of thrill rides, including roller coasters like Kraken and Manta at SeaWorld Orlando and Steel Eel and The Great White at SeaWorld San Antonio. Journey to Atlantis, a combination roller coaster and splashdown ride, can be found at all three US parks. One of the biggest attractions is the Shark Encounter, in which guests are carried through a submerged acrylic tube into the sharks' tank. Another famous ride is Wild Arctic, simulating a helicopter ride to the Arctic. After the ride, the guests arrive at a simulated base station, where they can observe polar bears, Pacific walruses, and beluga whales. During the Christmas holiday season, SeaWorld Orlando's Wild Arctic is transformed into the Polar Express Experience which offers the park's guests the opportunity to ride the Polar Express to the North Pole and meet Santa Claus in addition to the polar bears, Pacific walruses, and beluga whales that are at the Wild Arctic exhibit year round. Another attraction is the Penguin Encounter, showcasing a variety of penguins. In addition, an attraction features endangered Florida manatees. The park has an extensive playground for children, named Shamu’s Happy Harbor. SeaWorld recently created the non-profit SeaWorld & Busch Gardens Conservation Fund. 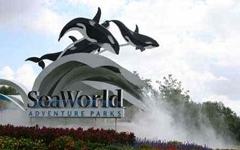 Sea World is accredited by the Association of Zoos and Aquariums, meaning they have met and exceeded the standards in Education, Conservation and Research.